Korean BBQ Bulgogi is one of my favorite meals on earth. 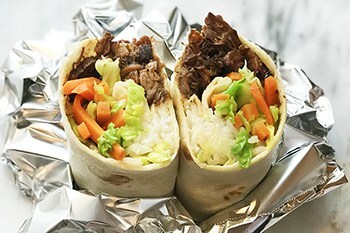 Slow Cooker Korean BBQ Bulgogi Wraps with cabbage, carrots, and rice is one of my guy’s favorite meals on earth. Succulent flavors of South Korean bulgogi, easy to prepare with a slow cooker, a bag of coleslaw and wrapped up in a flour tortilla. Incredibly delicious! Beef: Place the beef in the bottom of a slow cooker and add crushed pears, ginger, scallion, and garlic. In a small bowl combine soy sauce, brown sugar, sesame oil, salt, and pepper. Pour over meat in the slow cooker. Cover and cook on HIGH for 3-5 hours, LOW for 6-8 hours, or until very tender. While still in the slow cooker, shred beef with two forks, combining all of its juices and sauce. Prep burrito fillings: cook the rice, wash the coleslaw or shred your own, and mince cilantro. Lay a flour tortilla flat. Place the rice, meat, cilantro and coleslaw in the middle of the tortilla. Drizzle with sriracha or hot chili oil if using. Fold the sides up, then roll it up. If you’re saving or freezing for later, wrap with foil.